Whether you’re a kid, or an adult, or an adult with kids, there’s one thing we can all agree on, snacks are delicious and fun to have! It’s that little not-quite-a-meal treat that holds you over from breakfast to lunch, lunch to dinner, or dinner to bedtime. We learn from an early age that snack time is essential and wonderful. No matter your age, when you live an active lifestyle like me as a SAHM, snacks can come in handy for you and your little ones! It doesn’t matter if you’re team snacks or no snacks, keto snacks are where it’s at because they’ll help you feel full and will not even hinder your weight loss! It’s the solution snack-happy people have been looking for, and even those who don’t believe in snacks might be tempted by some of these fantastic options while following a keto diet plan! Snacks are so satisfying because they can help stave off boredom and feed into your emotional needs sometimes too. This is where snacking can become problematic though. When we eat high-caloric, unhealthy snacks like chips and chocolate bars we can quickly become sabotagers of our diets and ruin proper meals by overeating at the wrong times with the wrong foods. Not only are keto snacks healthier than your average snack, but they also pack way more nutrition per bite and will help you feel fuller sooner so that you don’t end up blowing your diet efforts. Wherever you are on the snacking spectrum, the snacks listed below will be sure to delight and even encourage weight loss in the process. So let’s get snack-a-lackin! Keto fat bombs are as cute as they sound. 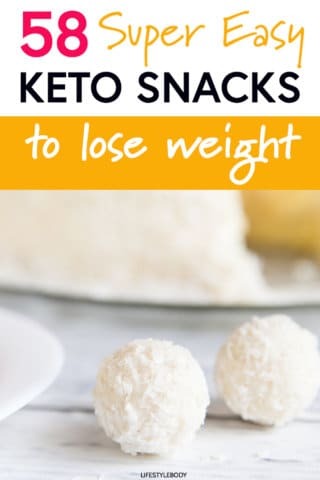 They are little, often roundish snacks that are high in fat and low on carbs which is what you’re going for on the keto diet! They are frozen after being made so you can make large batches to last your family for a long time. Keto bombs are literally a bomb of fat. A good dose of fat has been proven to keep you full and have your energy levels sustaining all day no matter where you are or what you have going on. They’re the pretty perfect in-between-meal option that won’t have you bombing your diet. These little guys are so sweet and satisfying that they’ll have you feeling a little bit naughty and wondering if they’re too good to be true. Don’t worry though. It’s not cheating – it’s the ideal snack when following the keto lifestyle. Aren’t these decadent looking? They are delicious keto snack for the middle of the day slump pick-me-up. Enjoy this sweet and savory fat bomb. Simple but delicious! This will satisfy your sweet tooth and will have you torching fat faster than you can say the word “ketosis.” What’s great is that this fat bomb recipe is Paleo friendly and gluten-free! Yay! Who doesn’t like the candy bar Butterfinger? It’s a staple for Halloween treats. But now, you can enjoy the taste without any guilt. This is a keto approved and adapted recipe! No sugar here! If you’re not a chocolate lover – like my husband – then here’s a fat bomb keto snack for you! The white chocolate Butter Pecan Fat Bomb have only .5 g of carbs per fat bomb! You can’t beat that! I love Ferrero Rochers! But I know they are bad for your health. So when I found out about this keto snack recipe I was hooked! And it’s also vegan friendly! Yes! This keto snack only has three ingredients and only takes 5 minutes to make! Now, this is a snack you need to have on busy days! You might think strawberries are too high of a carb food for the keto diet but in moderation you can have strawberries and still remain in ketosis. With this keto snack there is only .5g of carbs so you’re safe! For the more savory snackers out there, these cheddar and everything “bagel” bites will nosh your desire for bread-based snacks. Yes! Because being on the keto diet means no more bread and sometimes you’ll miss that comfort food. But, not anymore! These cute “bagel” bites will do the trick on touch keto days. Who doesn’t love pie? These pecan pie bites are a decadent treat for sure. You can pack them up for work or school! Another satisfying savory dish are these jalapeno poppers loaded with bacon. They are drool worthy and a great snack repertoire addition on your keto diet plan. Did you run out of time to have breakfast but want some eggs anyway? These deviled eggs with avocado will keep your fat to protein ratio in check too. And you know what? Having a “vegan-keto” snack is my thing! This is how I incorporate both the plant-based and keto diet into my daily eating habits! Lots of veggies, fat and good hearty protein. Raspberries are another keto-sensitive fruit that should be eaten in moderation. But, who can resist these dark chocolate raspberry fat bombs? Decadent and delicious for sure! If you’re as obsessed with pumpkin-spiced latte season as the next gal but don’t want to mess up by drinking sugary-syrupy coffees, these pumpkin spice bombs will have you dreaming of sweater wearing and fallen leaves season. These cute little pizza bombs are a great idea for game night or anytime your craving some ‘za really. And with the olive hat, and pepperoni blanket, you’ll have fun eating them too! My kids LOVE Nutella, and I love making these for them as a snack as one we can all feel good about. Yes, it’s healthy and will help you and your little ones feel full all day. You can have your cookie and eat it too! Yes, on a keto diet you can have cookie dough fat bombs with no guilt. You’re probably short on time and always on the go and want easy-to-grab items while running around. These 3 ingredient keto snack ideas will allow you and your family to stick to whole food and non-processed ways of eating and will keep it simple and time efficient for you too. It doesn’t get much easier than this! Snacks are usually prepackaged and convenient, but these 3 ingredient keto snacks are uncomplicated and contain all the things you probably already have in your cupboard. Coconut is one of the healthiest fats out there, and your heart, hair, skin, and nails will appreciate these little high-density nutrient nuggets being consumed by you at any time of day. These snacks will have you feeling on cloud nine and you probably already have all the ingredients to make them right away! A “lite” fluffy keto snack for those hard carb cravings. Snacking on peanut butter is THE best. These PB balls will keep you happy and healthy. Plus they are Paleo and Vegan friendly! My kind of keto snack! You can even have peanut butter cookies on this keto diet, and they’re just as good as the real thing – and much more healthier! Sugar-free brownies for real? Yes, these will earn some brownie points around your home for sure. Bacon and cheddar cheese balls in under 5 minutes? Heck ya! Only three ingredients too. Freeze these and take them on the go or for a pick-me up in the middle of the day. If you’re looking for a salty snack, these fathead crackers should be at your arsenal. Dip them in cream cheese for a delightful filling keto snack. These pickle wraps are quick and handy and easy to eat from yoga to school, to soccer practice. Your friends will enjoy them too! This party mix keeps well in a plastic baggy or Tupperware for even the most casual of snackers. Munch on these on the car ride to work or the bus ride to school! This granola is low on carbs, high in flavor and only requires 5 ingredients to make! Add all the ingredients together and bake in the over for about 22 minutes and sprinkle with cinnamon! These pizza pockets will have you reminiscing about your childhood school lunch days and are great for when you don’t have time for dinner at home. One of the hardest things about going keto for me is giving up chips. Well with these tortilla chips, you don’t really have to give anything up. Needing breakfast on the run? How about some delicious keto-friendly breakfast muffins. You make these ahead of time and can freeze them for on-the-go. There’s no more missing cerals on the keto diet. You can have a low carb cereal like this cinnamon crunch version and not feeling guilty about it! Another easy keto muffin snack you can make and freeze for on-the-go. This makes a great breakfast or mid-day snack. Love me some bacon and guac up in here! This is a fun (and somewhat messy) fat bomb keto snack to satiate your hunger. Paleo snacks are very keto friendly and very healthy too. These gluten free and dairy free meatballs is a light snack for the keto dieter. Have it for lunch with a cheese stick or pop one or two meatballs for a keto snack. Here’s another “vegan-keto” snack that’s super healthy. Fresh veggies and a fat-healthy dressing. Have this for lunch and feel full for hours. With your keto pizza pockets you can also have keto breadsticks for a complete dinner (oh, don’t forget the salad of course!). 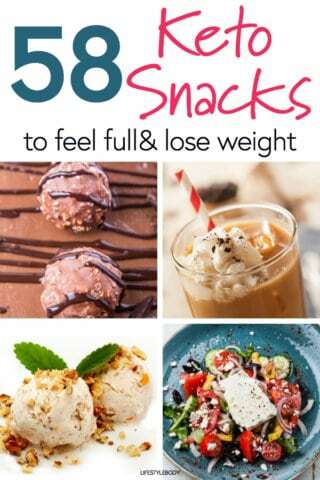 These 58 snacks will help give you variation in your snacking habits for an entire month so you don’t get bored with a lack of options. Snacks are meant to be enjoyed and can keep your metabolism revving all day so long as you don’t go overboard and enjoy everything in moderation. I will forever be a snack queen and will be on the hunt for new snack ideas that keep me on track. If you love to snack and have been so inspired by these keto snack recipes to come up with your own, let me know below!